Make a sparkling homemade crystal Star of David or other type of star to celebrate the holidays! This project is extremely easy, resulting in a keepsake ornament overnight. To form a Star of David, bend a pipe cleaner into an equilateral triangle and twist the ends of the pipe cleaner together to secure the shape. Repeat this with the second pipe cleaner. Overlay the two triangles over each other to make the six-sided star. If you like, you can twist the triangles together a bit to hold them against each other, although the crystals will grow over the shape to hold it into a star anyway. To form other star shapes, take a long pipe cleaner and bend it at angles, much like if you were drawing a star on paper. You don’t need to twist the end onto the star because crystals will seal the shape. Find a cup or bowl large enough to hold the Star of David. In a separate container, mix borax into very hot or boiling water until it stops dissolving. You will know when you have enough borax (saturated solution) because undissolved borax will start to collect at the bottom of the container. Pour this solution over the star in your bowl. Try to avoid getting undissolved borax in the container. If you do, it won’t ruin your ornament, but it will compete with the star for crystal growth, so it might slow down your project. If the container is large enough, you can suspend the star into the liquid from a pencil or butter knife to keep the star from touching the sides of the container. The Star of David shown in the photo was simply placed in a jar, so the project works either way. Place the container in a place where it won’t be disturbed and allow crystals to grow several hours or overnight. You can loosely cover the container with a paper towel or coffee filter, but make sure not to seal the container so that liquid will be able to evaporate. 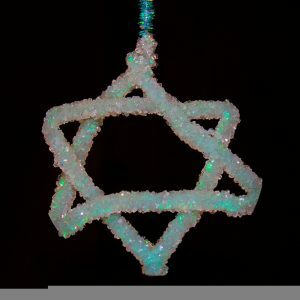 Remove the crystal Star of David from the solution and set it on a paper towel or hang it to dry. You can store the star wrapped in tissue paper to keep it pretty.